Can you believe that Clemson is ranked #1 but it’s an underdog against my Tide? OSU is right; Clemson is way overrated! Remind us who started this thread. Are you saying that you’re sympathetic to those that hate Clemson, you change team affiliate avatars like the wind. You’ll be changing again after the Sugar Bowl. [quote=“Tacitus”]Old friend, I can see that your skill with the English language has not improved. Your screw up was real and recent. Now why would anyone believe that fake image of yours when I've already proven that you were not being truthful when you said that you "don't know Bevis". Oops. 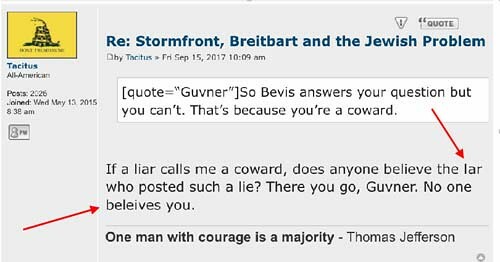 Bevis/Guvner (also proven) was the originator of the fake that you just posted, yet you claimed not to know "Bevis". What a joke. [quote=“osu-grad”]Looks like Clemson is now a 2.5 point underdog. Did you want to argue that?Tacitus, did I spell overrated correctly? Like I said, Clemson was a 6.5 point underdog during the last championship game. Ohio State was a 2.5 point underdog before their game with Clemson last season. How'd that work out for the odds makers? I'm not only amazed that you spelled "overrated" correctly, I'm surprised that you have the gall to use it at all since you had to eat that crow last year when you used it against Clemson. Not too bright. Hey Tacitus/Partisan62, take that crap to the hidden forum where you spew all that Stormfront garbage. I know you know little of football but let’s at least agree that it will be a small upset should they beat Alabama, just like they upset Bama last year. [quote=“osu-grad”]....you spew all that Stormfront garbage. Let's see you prove that blatantly dishonest statement above, Bucknut. All it takes is a link. Truth is still a foreign concept to you, I see. In addition to your dislike for Clemson, your hatred of Christians is also showing through. Why don't you save the social/political commentary for the day that you are brave enough to return to that other forum, and stick to college football here. I'm on my way to Grove City Ohio, just outside of Columbus. Can't wait to converse with those Buckeye fans that have accepted their 31-0 loss. Not all Ohioans are Clemson Haters. But I have witnessed a Michigan fan wearing Wolverine apparel get embarrassed. Ohio State fans don't have any points to argue when I wear my "Clemson National Champion" apparel. [quote=“1 CAT FAN”]I’m on my way to Grove City Ohio, just outside of Columbus. Can’t wait to converse with those Buckeye fans that have accepted their 31-0 loss. Not all Ohioans are Clemson Haters. But I have witnessed a Michigan fan wearing Wolverine apparel get embarrassed. Ohio State fans don’t have any points to argue when I wear my “Clemson National Champion” apparel. As much as I like to give them a hard time, most Ohioans are pretty good folks who happen to like college football as much as we do. Lots of good old country folk like us. Ask the Buckeye fans who they will be pulling for in the CFP. Got this from a disgruntled Ohio State fan while I was visiting family in Ohio. Please under 18 prohibited! Clemson fans are not concerned about Urban Meyer having anxiety attacks. 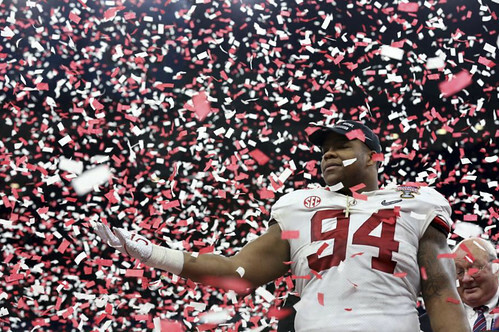 Unlike those Miami thugs who thought they had the swag back, #94 Da’Ron Payne has his priorities around his neck.